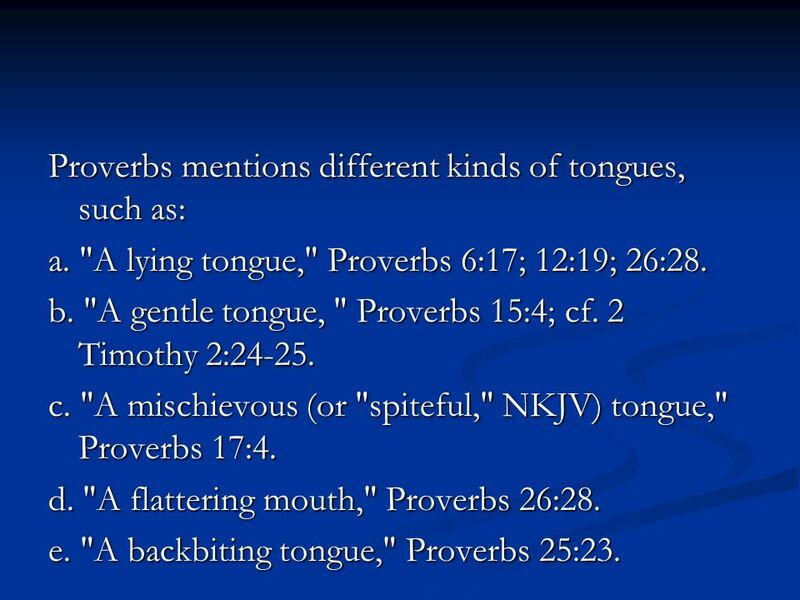 Proverbs mentions different kinds of tongues, such as: a. 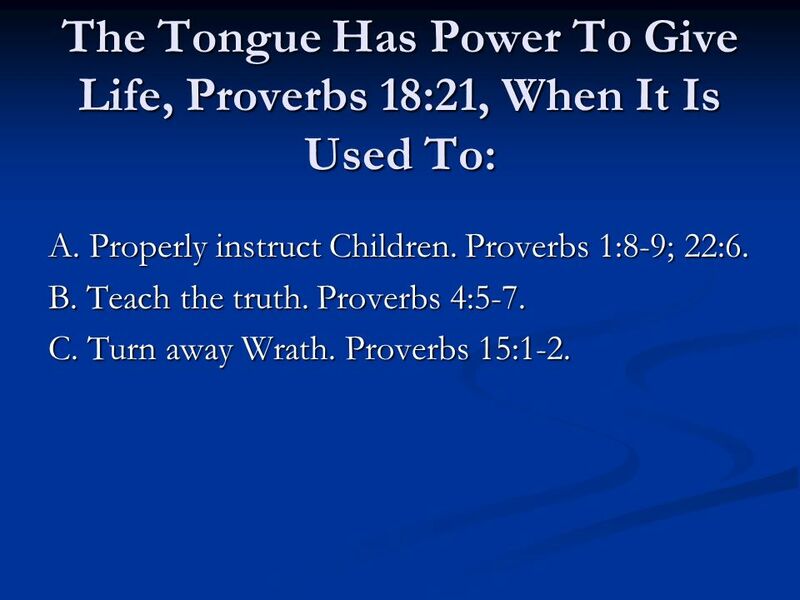 "A lying tongue," Proverbs 6:17; 12:19; 26:28. b. 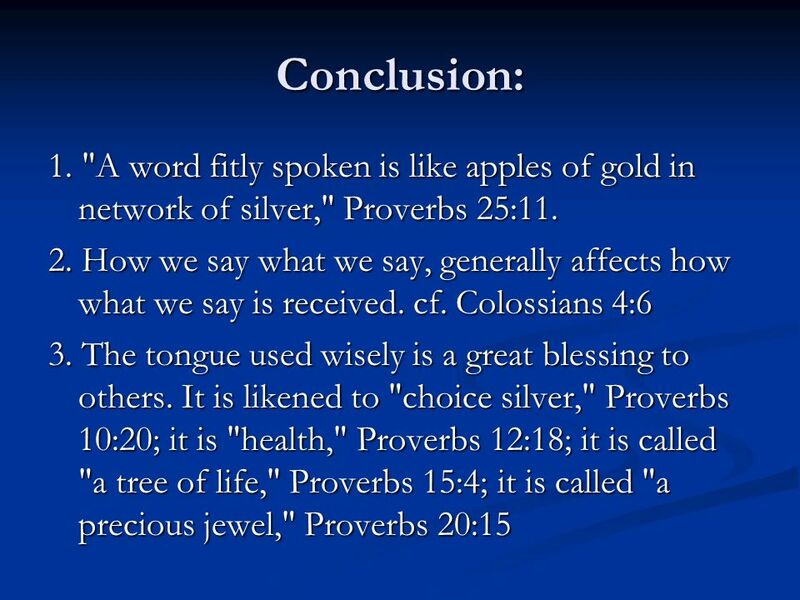 "A gentle tongue, " Proverbs 15:4; cf. 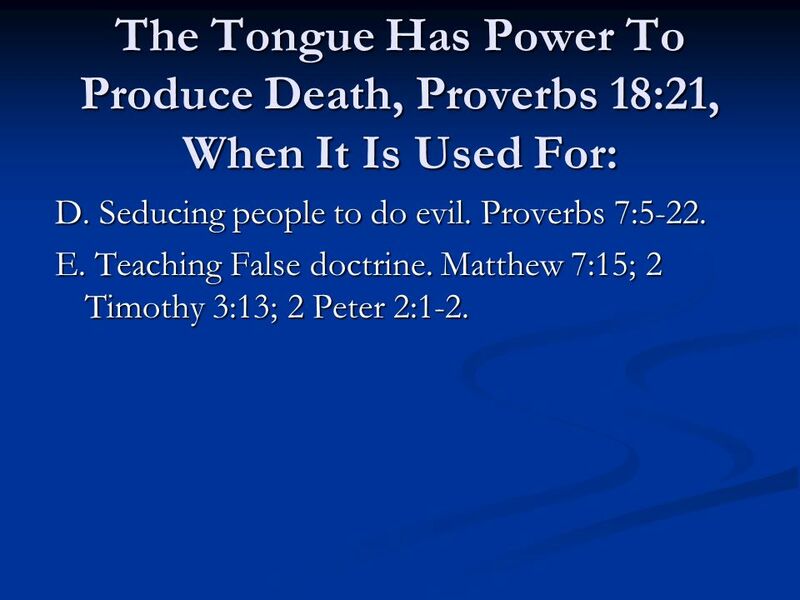 2 Timothy 2: c. "A mischievous (or "spiteful," NKJV) tongue," Proverbs 17:4. d. "A flattering mouth," Proverbs 26:28. e. "A backbiting tongue," Proverbs 25:23. 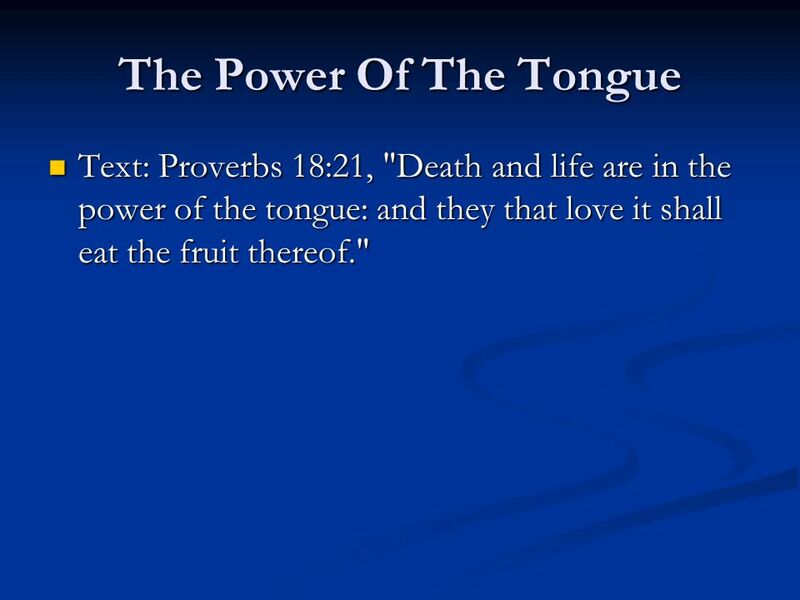 4 The Power Of The Tongue Text: Proverbs 18:21, "Death and life are in the power of the tongue: and they that love it shall eat the fruit thereof." A. Lying. Proverbs 6:17; 10:18; 12:19; 26:28. B. Giving False Testimony. Proverbs 6:19; 14:5. 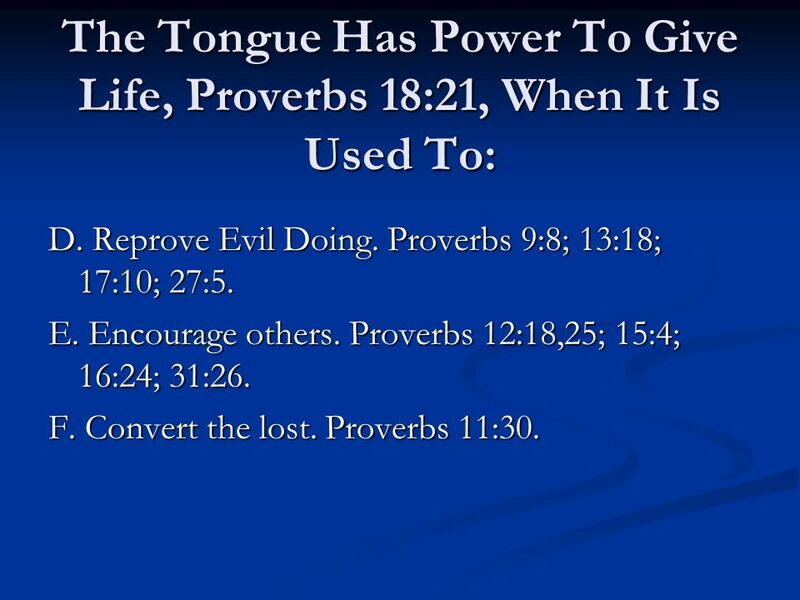 C. Sowing Discord, Proverbs 6:19. Discord is sown by: 1. 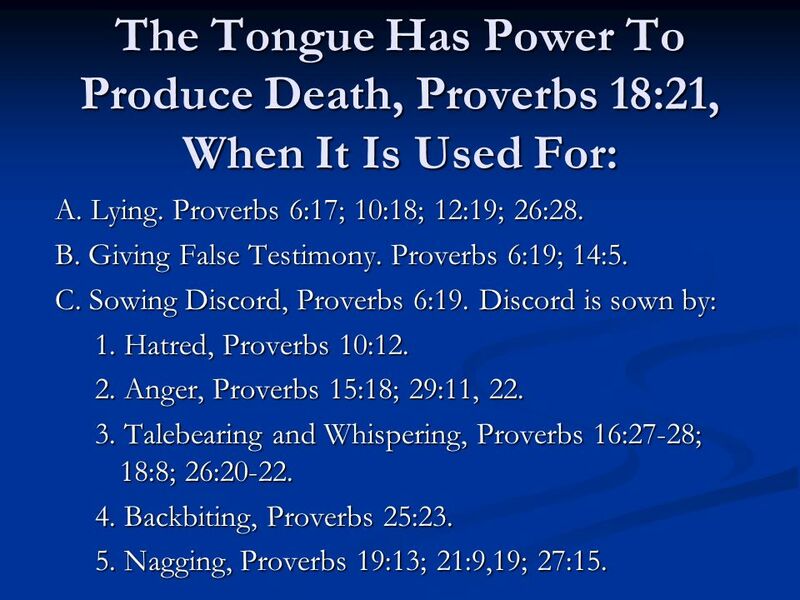 Hatred, Proverbs 10: Anger, Proverbs 15:18; 29:11, Talebearing and Whispering, Proverbs 16:27-28; 18:8; 26: Backbiting, Proverbs 25: Nagging, Proverbs 19:13; 21:9,19; 27:15. D. Seducing people to do evil. Proverbs 7:5-22. E. Teaching False doctrine. Matthew 7:15; 2 Timothy 3:13; 2 Peter 2:1-2. A. Properly instruct Children. Proverbs 1:8-9; 22:6. B. Teach the truth. Proverbs 4:5-7. C. Turn away Wrath. Proverbs 15:1-2. D. Reprove Evil Doing. Proverbs 9:8; 13:18; 17:10; 27:5. E. Encourage others. 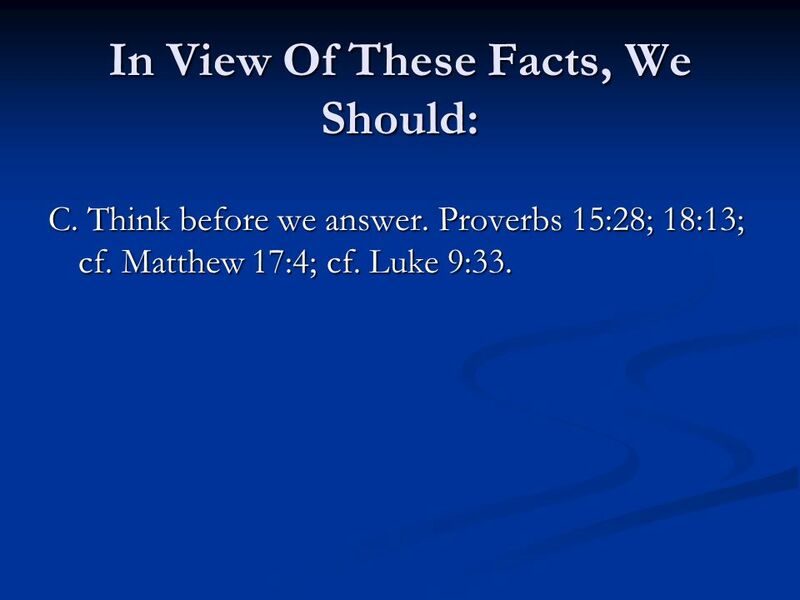 Proverbs 12:18,25; 15:4; 16:24; 31:26. F. Convert the lost. Proverbs 11:30. A. Use Restraint in speech. Proverbs 17:27-28. B. 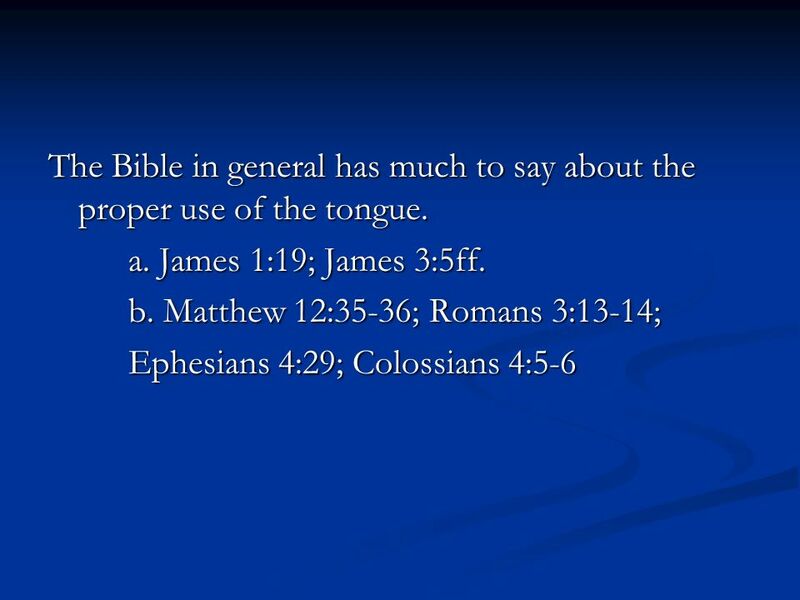 Guard our mouth and tongue. Proverbs 21:23. 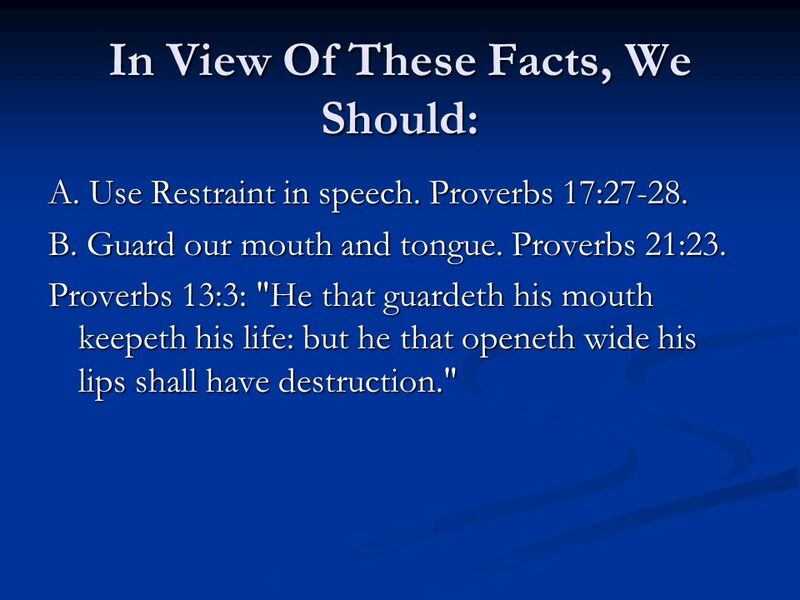 Proverbs 13:3: "He that guardeth his mouth keepeth his life: but he that openeth wide his lips shall have destruction." C. Think before we answer. Proverbs 15:28; 18:13; cf. Matthew 17:4; cf. Luke 9:33. 12 Conclusion: 4. 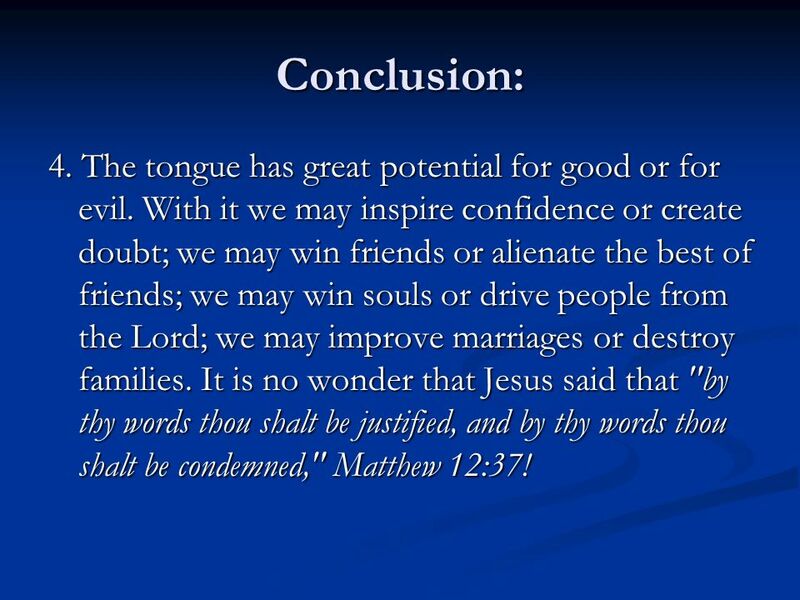 The tongue has great potential for good or for evil. With it we may inspire confidence or create doubt; we may win friends or alienate the best of friends; we may win souls or drive people from the Lord; we may improve marriages or destroy families. It is no wonder that Jesus said that "by thy words thou shalt be justified, and by thy words thou shalt be condemned," Matthew 12:37! 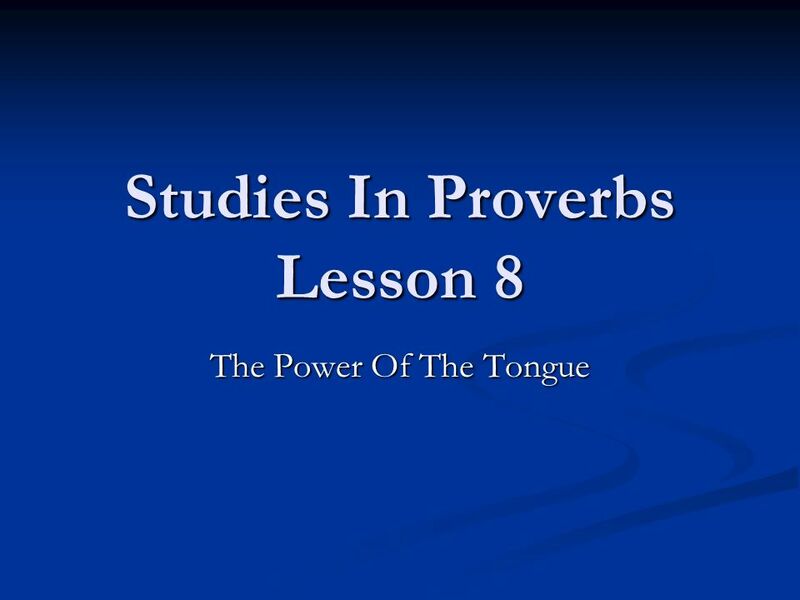 Download ppt "Studies In Proverbs Lesson 8"